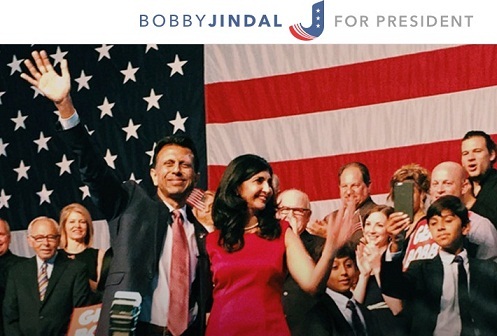 Bobby Jindal, Governor of Louisiana Becomes 1st Indian-American to Run for USA President. However in his announcement speech, he appeared to distance himself from his Indian roots. In his announcement speech, he appeared to distance himself from his Indian roots. “I’m done with all this talk about hyphenated Americans. We are not Indian-Americans, Irish-Americans, African-Americans, rich Americans, or poor Americans – we are all Americans,” he said. With his announcement, America's first Indian-American governor became the first Indian American to run for President of the United States (the first Asian American to run for President was Republican Hiram Fong in 1964). But within much of the community, some say, the historic moment won't really resonate. My name is Bobby Jindal, I am the Governor of the great state of Louisiana, and I am running for President of the United States. Gov. Bobby Jindal (@BobbyJindal) tweets on June 24, 2015.